Based in Singapore, TradeGecko specialises in cloud-based inventory management software. The start up provides small and medium enterprises with clever tools to manage inventory processes and keep track of their stock. By automating backend processes, TradeGecko enables their customers to focus on building their business. With a product the TradeGecko team fully believes in, customers soon poured in from all over the world, including New Zealand, Australia and the United States. To properly cater to them, TradeGecko needed a business phone system sophisticated enough to handle these calls. Initially the young company relied on mobile phones for business calls. As the business grew, they quickly realized they needed a more cost-effective method. TradeGecko selected Hoiio’s cloud-based telecommunication solution because of its ease of use and flexibility. What TradeGecko needed was points of contact for overseas customers to reach them at, as well as a solution that was affordable and could grow with the company. “Hoiio seemed like a solution that would provide us with the capabilities our growing team required,” says Kenneth Chew, Communications Specialist at TradeGecko. For countries with a significant portion of their market base, TradeGecko purchased Main Line numbers. 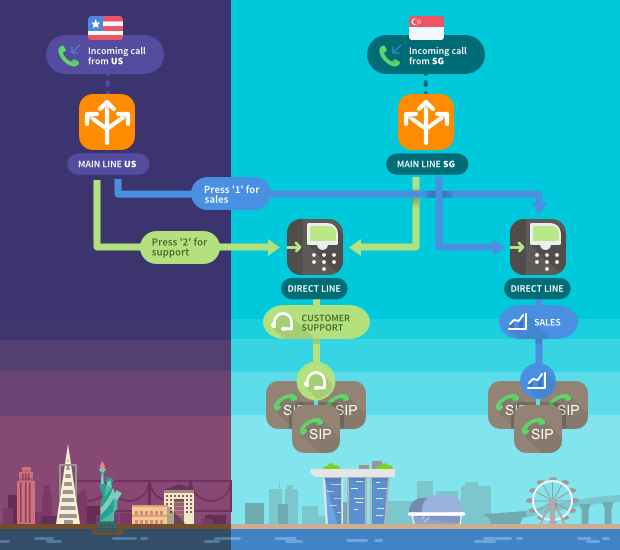 Each Main Line number is a landline number which customers can dial to reach TradeGecko. For example, a New Zealand customer could call the New Zealand number provisioned through Hoiio to reach TradeGecko’s office in Singapore. First, Main Line’s automated attendant segregates calls and routes them to the right department. They reach either the sales or customer support department via Direct Line’s call forwarding mechanism, which forwards the call simultaneously to each team member. Each staff member is equipped with a SIP phone line (provisioned through Hoiio) to receive these calls. Setting up their business call system with individual apps means that they can scale up or down according to business needs, as adding or removing apps is easy and not disruptive. For a young company poised for growth, this allows TradeGecko to expand their call system as the business develops.